Read How to Get A Brochure Translated Successfully. Read How to Get A Brochure Translated Successfully. How do I get marketing brochures translated? We explored in a previous article how to get company brochures translated. This focused particularly on technical content, such as product brochures, catalogues and health & safety information. But what about marketing brochures, leaflets, flyers, and guides? How can you ensure your marketing assets work just effectively in a new market, as they do here in the UK? Just as with any other marketing project, the first step is to assess your market and target customer. You will need to ask the question “does the source marketing brochure work in that market?” There may be aspects of it that don’t. The tone may be wrong, for example if you use humour it might not translate in the target market. Design elements may need optimising for a different audience; images, graphics, and colours may be inappropriate or simply less effective in certain countries. The aim when translating a marketing brochure, is for your target audience to believe that the content was created specifically for them. Linguists specialising in localising marketing content will review the source text, its’ tone, style and core message and how it translates in your target market. Translating marketing brochure content requires a balance between preserving brand messages, creative style and tone, yet producing a marketing asset that fulfils its’ objectives. In some instances, where elements of the source text do not align with the target market at all, transcreation specialists may be needed to rewrite some of your content in a way that will resonate with consumers in that market. Transcreation is the process of recreating creative marketing copy so it retains its’ core message and brand identity, but works effectively in the target market. At Comtec we have native-speaking copywriters in over 200 languages who can work closely with your marketing team to develop this content. Once translation or transcreation is complete, a second fully qualified linguist then proofreads the content in detail to ensure complete accuracy and fluency of the text, ensuring that it has the same impact as the source and is aligned with your marketing objectives. With the translated text, the DTP team now have the job of fitting it into the available space in your marketing brochure. Not always a straightforward job! Language expansion is often a challenge. This is where the translated text occupies more space than the source text. English is a relatively concise language and therefore it is common to see language expansion in other Latin alphabet languages. Of course if your marketing brochure requires translation into a language using a different character set (Urdu, Arabic, Chinese etc. ), the text can expand vertically as well as horizontally. Add to the mix right-to-left languages like Arabic, and there are even more challenges to overcome. This is why out DTP team love white space! 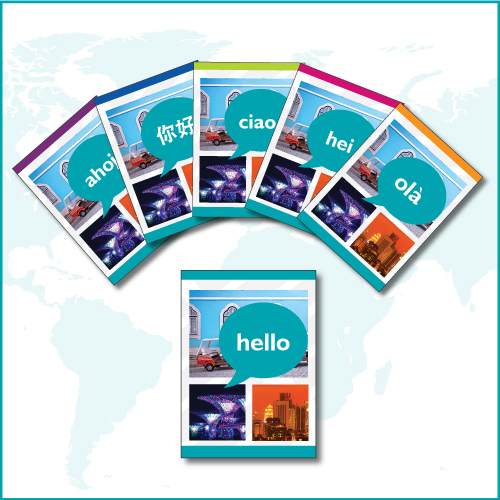 We would advise any creative or marketing team working on new brochure projects that might be translated further down the line, to consider how language expansion could affect the design. Marketing brochure translation is not just about the text. It also includes localisation of design elements such as graphics and images. Common changes that are required at this stage include changing currency symbols, replacing location specific images with more relevant ones, ensuring the right ethnicity and cultural references, and removing any details that point to a UK target audience. In some cases we may also suggest alternative colours, whether to graphics or the text; colours often have different connotations in different countries. The translation process involves collaboration between the translation and DTP team, working together to resolve issues such as language expansion. However, once the artworkers are happy, the entire brochure requires careful linguistic review to ensure a high quality translation and localisation project. The translation team are not just looking for any formatting errors, such as line breaks, but also reviewing the graphic elements to ensure the final document has the same impact as the source and is aligned with your marketing objectives. Fortunately you don’t need to find all these individual experts yourself. Partnering with an experienced and trusted translation service provider means you can offload the entire project and let them manage it for you. Creative and marketing agencies who are managing complex projects for their clients, as well as in-house teams, will find that outsourcing marketing brochure translations is a cost and time effective solution. For more tips and advice on handling marketing translations, download our guide here.